At the begining of the month the new version of the Scrum Guide was introduced. The amount of changes was not big, no surprise there. 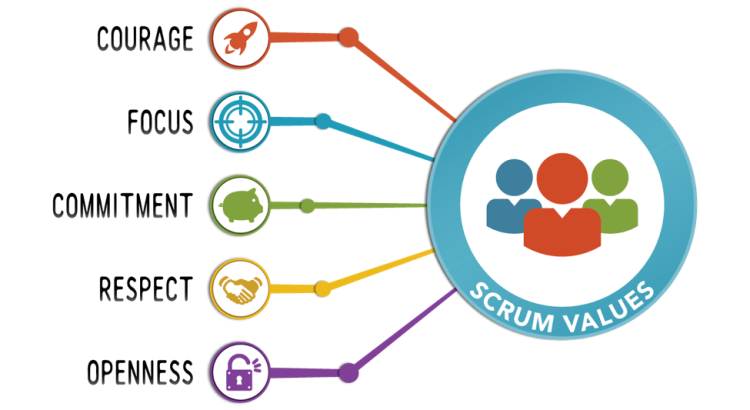 The Scrum Values themselves were discussed in the webinar and also by Gunther Verheijen, in this post I’ll give a short personal impression on the way the values come into play. Personally I feel the term itself feels a bit unwelcoming, just because of the ‘old’ interpretation of committing to work in a sprint planning. Why reintroduce the term here? I have met several teams who felt uncomfortable committing to anything sometimes. At this point I cannot offer a better word describing the value yet, I am stuck at ‘Willingnes’…..
At the heart of the Scrum cycle lies the constant focus on the sprint goals. For me I always coach my teams to look beyond the end of the sprint and think about the next release coming up. This helps in understanding the bigger picture and enables the team to make better choices in priorities and approach. Openness is the Value equivalent of transparency as one of the pilars of Scrum. For me openness is sharing everything within the team and outside the team. We share the good, the bad and on occasions the ugly. Building up confidence in the idea that sharing and understanding is better than witholding and covering information is key for teams to really connect with the stakeholders. As self organizing teams we cannot do without respect for each other. The prime directive used in many retrospectives is clear good example. In my opnion this directive and the Value are the same and are present in the entire sprint and emphasis in the retro is just a small reminder of this value. We don’t know or we cannot do something are phrases people are reluctant to use. It is not in our system and often teams stay a bit too close to the things others would like to hear. Yet, we should use them more often to show that we do understand the problems but we just cannot solve them now. The five values offer an insight in the way we think about transparency and the way the team members collaborate with each other and with stakeholders. So they have value indeed. I do expect a some negative reactions from the people who already miss the real believe in Scrum.